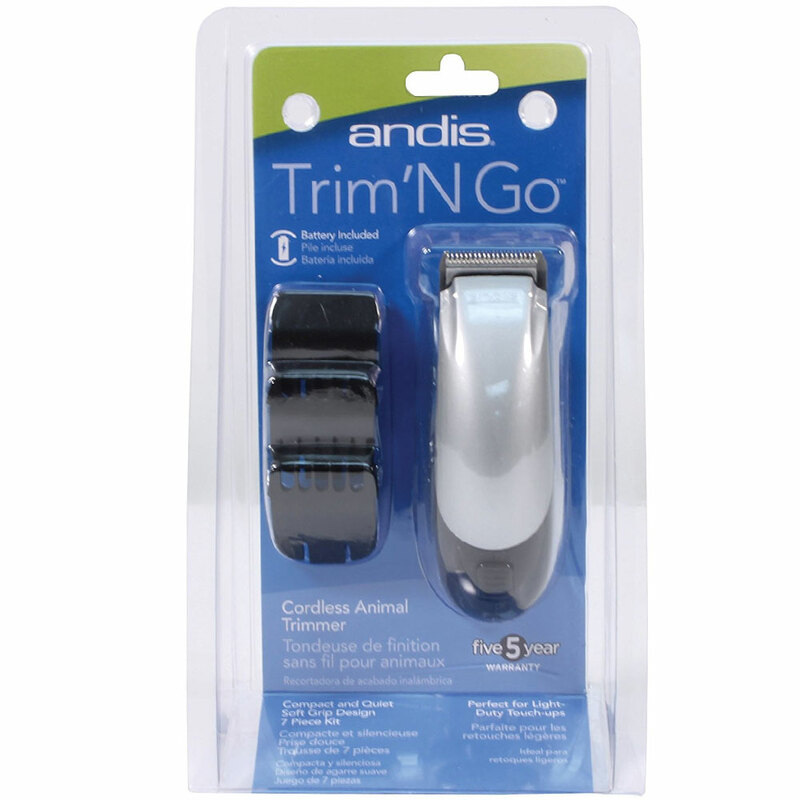 Andis Trim 'N Go Cordless Trimmer - Silver/Black has an ergonomic lightweight design for the ultimate in comfort. Andis warrants its products to the original purchaser against defective material or workmanship for one year from the date of purchase. All implied warranties are also limited to one year. Andis will replace the product without cost to the consumer. IMPORTANT SAFEGUARDS: When using an electrical appliance, basic precautions should always be followed, including: Red all instructions before using the Andis Trimmer. 3. Do not place or sotre appliance where it can fall or be pulled a tub or sink. Do not place in, or drop into, water or other liquid. 1. This appliance can be used y children aged from 8 years and above and persons with reduce physical, sensory or metal capabilities or lack of experience and knowledge if they have been given supervision or instruction concerning use of the appliance in a safe way and understand the hazards involved. 2. Children shall not play with the appliance. 3. Use this appliance only for its intended use as described in this manial. Do not use attachments not recoomended by Andis. 4. NEVER operate this appliance if it is damaged, if it is not working properly, if it has been dropped, or dropped into water. Return the appliance to an Andis Authorized Service STation for examination. 5. Do not use this appliance with a damaged or broken blade or comb, as injury to the skin may occur. 6. Do not use immerse trimmer in water. Use a soft bristled brush to remove any hair from blade. 7. Caution: Dispose of used battery properly. Do not incinerate; battery may explode if overheated. OPERATING INSTRUCTIONS: Please read the following instructions before using your new Andis clipper. Give it the care that a fine precision built instrument deserves and it will give you years of service. You can set the blades for a coarser cut by attaching any of the snap-on blade attachment combs made for your Andis trimmer. The blade attachments mount easily. To use a blade attachment, slip the cutter blade teeth into blade attachment. Snap the blade attachment down; it will snap on and off easily. Combs help guide hair to cutting blades and give you precise control of hair lenghts. Your Trimmer uses one "AA" battery. To insert battery, remove battery cover on back of unit, Insert battery. USER MAINTENANCE Cleaning and user maintenance shall not be made by children without supervision. The internal mechanism of your trimmer has been permanently lubricated at the factory. Other that the recommended maintenance described in this manual, no other maintenance should be performed, except by Andis Company or an Andis Authorized Service Station. BLADES When trimming is complete, slide on/off switch to off position and remove the attachment comb (if being used). Lightly brush out blades with the blade cleaning brush provided. For best results should be handled carefully and never used to cut dirty or abrasive material. CORRECT DISPOSAL OF THIS PRODUCT This marking indicates that this product should not be disposed with other household wastes throughout the EU. To prevent possible harm to the environment or human health from uncontrolled waste disposal, recycle it responsibly to promote the sustainable reuse of material resources. To return your used device, please use the return and collection systems or contact the retailer where the product was purchased. They can take this product for environmental safe recycling. CAUTION: Never handle your Andis trimmer while you are operating a water faucet and never hold your trimmer under a water faucet or in water. There is danger of electrical shock and damage to your clipper. ANDIS COMPANY will not be responsible in case of injury due to this carelessness.